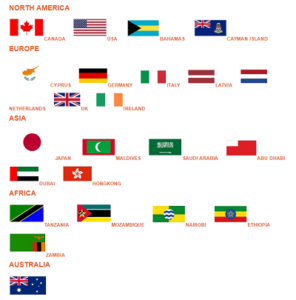 We have exported to almost all continents except South America and to 23 countries as India is very strong with labour intensive promotional products. Many strong promotional gift companies regularly buy from us their gifting requirements which we ship to all over the world on their behalf. India also imports many promotional goods from China but these are items which are machine made and require very large quantities manufactured at huge volumes to cater to the whole world. These items China has an edge and Indian companies too prefer to import from China due to better price and good finish at different price points. But the moment the items become labour intensive India has an edge over China and even the regular international gift buyers of China prefer to buy from India to save on overall cost. Again, China speaks the language of large numbers only and due to unique Indian set up all orders including small, medium and large can be catered at attractive prices. The various items where India has an edge includes complete promotional apparels range like t-shirts, caps, jackets etc. We have exported mouse pads, coasters, table mats, pens, keychains, wooden items, jute bags, carry bags, including many customised odd items like compact disc Buttons etc. to above countries. We have delivered to many MNCs on behalf of international promotional gifts companies for their local country offices within India. Many MNC companies from abroad directly ask us to deliver gifts to their local outsourced Indian staffs working with various BPOs. Many event and advertising companies have bought for their own promotions and even to cater to their regular clients. Many companies who have local presence in India prefer to contact us directly from abroad and place their international currency paid orders for delivery to their Indian outfits. Similarly many companies planning to participate at the exhibitions in India and abroad source materials to be delivered directly to their stalls. The new fast catching trend in the world is the global procurement offices to source various products from the best place at the least possible prices. We have been a regular contender here to understand the competitive landscape and identify products where India has some advantages over other countries. Here we have competed against many Asian countries and found our prices and quality appreciated by the buyers. We noticed that some of our products qualities are not as advanced as demanded by the strong currencies and at the same time our quality is superior when the products where sourced from the weaker currencies. We have even competed against multiple currencies by quoting prices including custom charges & local warehouse delivered to make it easy for buying office to compare various factors to take a better decision.